Zucchini are a delicious sausage-shaped vegetable that grows on vines that spread along the ground. They have a dark green, thin skin which is edible and inside the flesh is creamy white with tiny seeds that can also be eaten. Although zucchini can grow very large indeed, mostly it is grown to around 20cm long before it is picked. Zucchini are sometimes called courgettes or summer squash and they are related to pumpkins and melons which also grow on a vine. The leaves of a zucchini vine are large and these help to shade the fruit as it grows underneath. A great idea is to build a climbing frame or trellis which the vine will scramble up as this will keep the fruit off the ground. Choose a spot in the garden where there is lots of space and that gets at least 6 hours of sun every day. Prepare the garden bed by removing any weeds and digging lots of compost into the topsoil. Use a dibbler or big stick to make small holes about 80cm apart and gently place one seedling into each one, pushing the soil around the roots. Water the seedlings lightly. 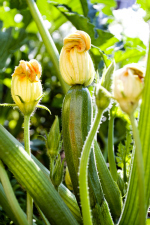 Zucchini can be grown in large containers such as barrels or tubs but there needs to be a climbing frame or at least room around it for the vine to grow. Fill the containers with premium potting mix and water it lightly. Place two seedlings in each container and water again. Zucchini like to have the soil kept moist so give them some water every day. If lots of compost was added when they were first planted, they may not need any fertiliser but if the leaves start to go a little yellow, feed them with liquid fertiliser or composted manure. Every now and then, arrange the leaves so that they shade the zucchinis underneath. Zucchinis should be picked when they are about 20cm long because if they are left on the vine too long they will become very tough. At this size, their skin will be dark green from one end to the other. Start picking the zucchini as soon as they are ready as this will encourage more to grow. Store them unwashed in a plastic bag in the fridge. Zucchini is a very versatile vegetable which is usually eaten cooked. The easiest way is to cut it into cubes and microwave or steam it for 2 or 3 minutes and then serve it with a little salt and pepper. It can also be cut into slices that are about 1 to 2cm thick, drizzled with olive oil and cooked on the barbecue or in a frypan for about 4 minutes on each side. There are even some fantastic recipes for zucchini fritters and muffins but one of the yummiest of all is zucchini slice which can be eaten both hot and cold. Find more great recipes in the Smarty Plants Kitchen. 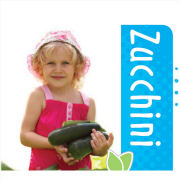 Zucchini grow on a vine that spreads along the ground but it will also climb up a trellis if one is available. 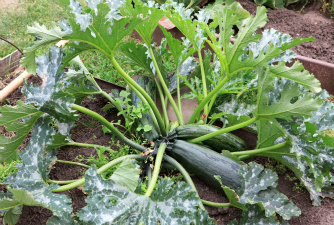 The vine has large green leaves which shelter the zucchini as they grow. A zucchini plant has both male and female flowers. Bees and other insects collect pollen from the male flower and carry it to the female flower which then begins to grow into a zucchini. The flower eventually drops off and only the zucchini is left. It is easy to tell the difference between a male and female flower by looking at the stem it is attached to. The female flower is attached to a small, round ball which is what becomes the zucchini. The male flower is simply attached to a stem. Ripe zucchini ready to harvest. Height/Width: The vine can spread to cover an area of around 70cm x 70cm and 30cm high.